As I've said many times over: I enjoy beer tremendously. But for me it's just a fun beverage. I know absolutely nothing about beer and I'm not really interested in learning anything about it. Wine, on the other hand, is an obsession. If you've seen my wine reviews you may not think so, but I take wine very seriously. 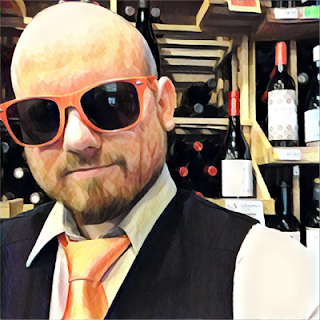 But yes, I do occasionally do beer reviews on this wine blog. Why not? It's my website! A year ago I wrote a whole article on the starches that spirits are made of. At least I'm keeping on the topic of alcohol. Plus, beer and wine have been hanging out with each other since the dawn of civilization. They're brothers of fermentation. AleSmith is out of San Diego, California and has been around since 1995. But are we gonna talk about them all day? Boring! Let's talk more about me while I drink their beer! Hurray! You've probably heard of barleywine, which is made from barley and probably the booziest of the beer styles out there. Well, this is made in that same style except from wheat. I love barleywine and I love wheat beers (probably my two favorite categories of beer if stouts went extinct) so I'm very excited to try this! It comes in a 750 ml bottle with a gold foil. Take that foil off and there's a beer cap, as opposed to the cork you may be expecting. It has a 10% ABV. Just look at that hazy copper color. That's a thing of beauty. Clearly it's a wheat beer. And clearly it's going to completely nullify today's physical campaign on the stationary bike. There's aromas of toffee, honey, mango and plum. And it's all very lively. 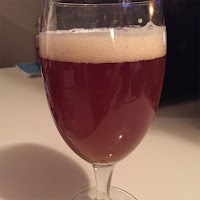 I'm glad a friend suggested to pour it into one of my tulip-shaped stemmed beer glasses to capture the aromas, because it wouldn't be the same in a pilsner or stout glass. He later texted me that a snifter would have worked too and I immediately threw a hissy fit and told him we're not friends anymore. Nah, I didn't do that. But I should have. A snifter would be PERFECT. It's very boozy on the palate, clearly done in the same style as a barleywine. However the rest of its character is that of a wheat beer. Like, you know, wheaty and more delicate than barley. It's also very rindy like lemon zest and orange zest. So it's bitter from the hops but it doesn't dry your mouth out at all. In fact, there a bit of a dark fruitiness, specifically plums, on the finish. Well balanced I believe is the term. But don't listen to me. This beer hits hard and I haven't been spitting. I'm drunk already and playing air drums to Tears for Fears. I don't like to rate beer because, as I said, I know jack squat about it. But I really liked it and I give it a thumbs up. It's $17 retail for the 750 ml bottle but still worth it. 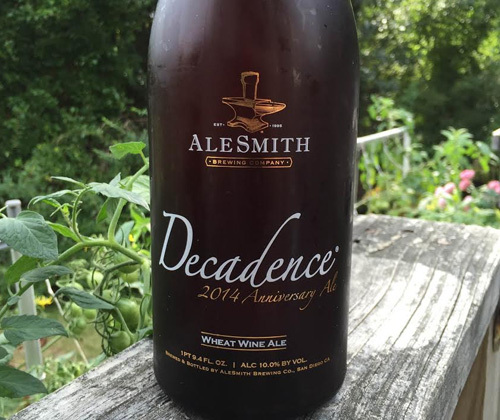 Wheat wine has suddenly become a category that I need to explore now. It's right up my alley.